Looking for something you've seen on my posts? I've made it easy for you to shop my favorite pieces. Shop luxury brands at an affordable price through theRealReal. Click here for more information! My week couldn’t have ended better! I got to job shadow at my dream publishing company & see the New York Philharmonic. Check out my go-to outfit that transitions perfectly from the office to a night out. Feelin' all the Lizzie McGuire vibes in Rome this week! Whenever I'm in Italy, I feel the need to wear red. Since Christmas is around the corner, I collected my favorite red dresses under $100, as well as my favorite tassel BaubleBar earrings! Check out my picks here! Belgian fries in Belgium...is there anything better?! Shop my favorite BaubleBar tassel earrings this season here! When the architecture is far prettier than your outfit...oh well! Staying cozy in Brussels with my chenille sweater. Shop my top picks here! Taking #mybaubles around the world with me! They were another favorite birthday gift this year from my best friend Julianna. I love the neutral color because it goes (and makes!) every outfit! Shop my Bauble Bar picks here! 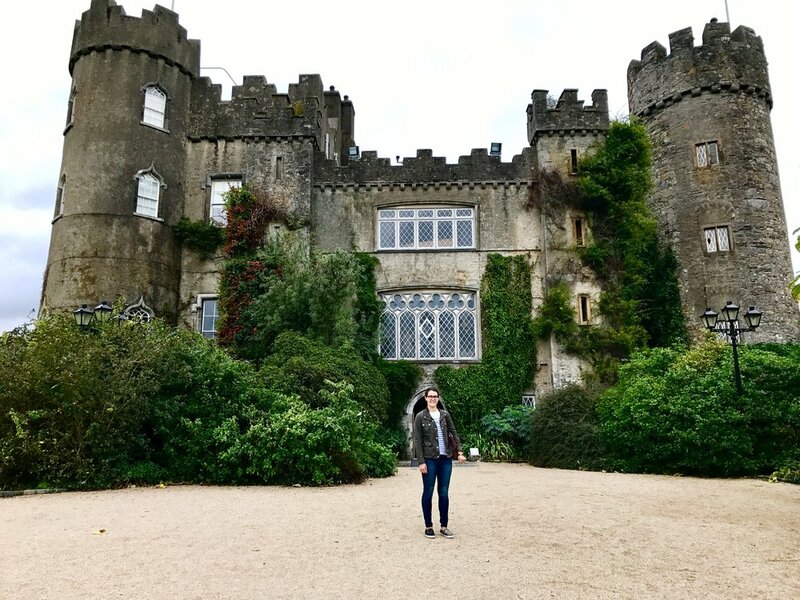 Get the details on everything I wore to my fifth Cliffs of Moher trip! Also, do you spot the initials on my bag?! Shop here! My sister gifted me my first GiGi New York bag for my birthday. It was one of the most sentimental things I've ever received being it has my blog's initials on it. I'm slowly getting more and more respect from friends and family for the work I've put into my blog, so this gift meant the world to me. It's super versatile, can fit file folders or a laptop easily, and the straps are the perfect length! Join the obsession here! I'm finally adjusting to the wet weather here in Ireland thanks to the help of my Jack Rogers wellies (under $40!) Shop my Fall essentials as I travel throughout Europe. Shop here. Chenille is back in style! Shop my favorite sweaters under $40! Enter my JORD Watch $100 giveaway here. I kept the skirt trend going throughout my weekend in London. Asos is carrying so many fun mini skirt options. Shop them here! My 21st birthday skirt! I was determined to wear something that made me happy, so a pink pleated skirt is what I chose! Shop my favorite pleated skirt look and basic black bags that go with every outfit here! The fun pants are out! You don't want to miss this high waisted flattering look (on sale!). Shop here. Shop my denim skirt & waist-tie shirt travel look here. I'm up to Northern Ireland for the weekend and the temperatures have definitely dropped! My go-to Fall items are on SALE now at J.Crew Factory that you don't want to miss! Shop my look here. This bracelet was one of the best gifts my Mom ever gave me. I always carry a little piece of home with me wherever I am in the world. She even got each family member's initial inscribed on the inside of the bracelet. I'm all for the sentimental gifts and The Coordinates absolutely nails it. They have something for everyone & here are a few of my favorite pieces. Shop here! "Legend Necklace" That elegant look that never goes out of style! "Meridian Ring" A tasteful ring with a special meaning! Shop my David Yurman bracelet, Hermés bracelet, RayBan sunnies, and embroidered dress! As a frequent traveler, I've realized how important it is to have practical & versatile bags to go with your outfits. This bucket bag is my staple & I've rounded up my top picks under $50! Shop here! Park Guell is my favorite spot to visit in Barcelona. I love all the patterns and colors, so to make sure I matched the vibe I put together a collection of some of my favorite embroidered dresses, accessories, and shoes. Shop my collection here! You know it's going to be a good trip with the "Lady Danger" Mac lipstick comes out! I love the bright colors in Barcelona & never miss an opportunity to bring out my favorite patterned outfits. Shop my bright & comfortable travel outfits in Barcelona here! The views at the Cliffs of Moher never cease to amaze me. These warm & comfortable closet staples are super versatile and have been my go-to items in Ireland this year! Click here to shop! Green is always a good color to wear in Ireland. I've loaded up my closet with J.Crew classics to get me through the rainy, brisk, but beautiful days. Shop my practical, everyday looks. Everyone needs a good statement earring (or several) and I found mine this summer at a Bauble Bar event. If you haven't signed up for their mailing list, you must! You'll get emails every time there's a sale or new products. I wear my Baubles daily and can't wait for my collection to grow. Click here for my favorites!